Yes, it’s been ten years since Hublot’s Big Bang was first introduced, and the collection has continued to grow throughout that time. This year, in celebration of this watch-filled decade, the Big Bank Unico Full Magic Gold is making its debut as the world’s only scratch-resistant gold watch. The fusion of materials is in Hublot’s DNA. Four years ago, Hublot created Magic Gold, the only scratch-resistant gold in the world, explained Ricardo Guadalupe, CEO of Hublot. 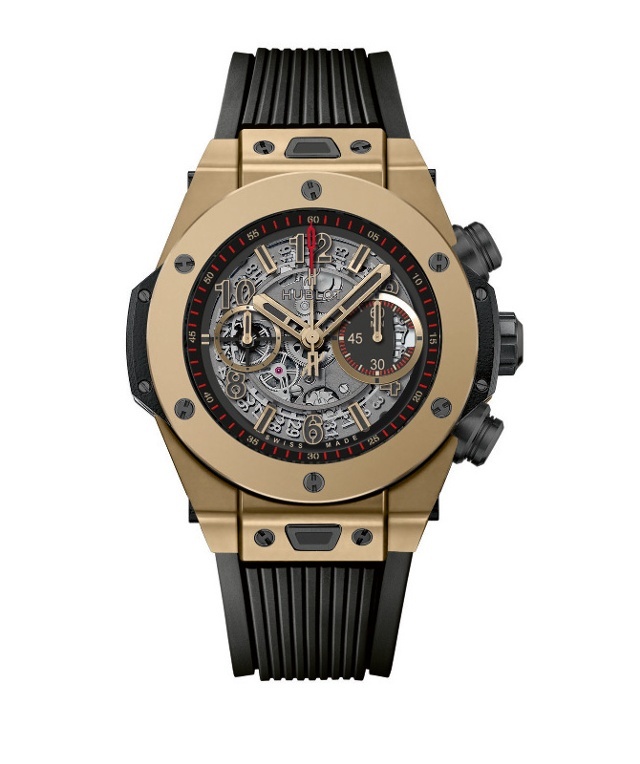 Still today, Hublot is the only brand to offer this material, whose hardness is close to 1,000 Vickers, more than twice that of standard 18-karat gold, which only reaches 400 Vickers. The new watch is a limited edition of just 250 pieces. Inside the 45mm polished Magic Gold case is the automatic flyback chronograph HUB 1242 UNICO movement with an anthracite gray treatment. The matte black openworked dial features small seconds at 9 o’clock, chronograph minutes at 3 o’clock and gilt-plated indexes with black SuperLuminova. The timepiece comes on a ribbed black rubber strap with a deployant buckle.